I enjoy that I am able to have a complete health record in one spot. The ability to upload documents is great and the format of the chart makes it easy to find what I need. Reports could be a bit more detailed. Also, sometimes I need to request a report be created for what I need for my role. Can be a bit slow when a lot of people are logged on all at once. We are not only keeping track of our clients using this system but we are also billing through it, so we do not need a separate program for that. This has saved us time and money. Program had ability to create custom documents. HIPAA compliant. Not very easy to use. There are too many screens to navigate when completing notes. I feel that it takes longer to complete notes on. It's easy to use. You dont even have to type a whole note as the service provides stored answers that u can select. 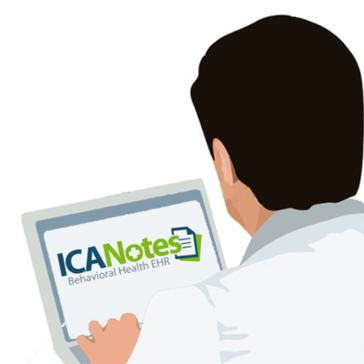 Every user of the company on this platform can review patient care notes written by others. "Easy to use and responsive customer service." The ease of templates and creation of necessary documents. Lengthy treatment plan process with too many options. Coordination of care, updated and timely paperwork. * We monitor all ICANotes reviews to prevent fraudulent reviews and keep review quality high. We do not post reviews by company employees or direct competitors. Validated reviews require the user to submit a screenshot of the product containing their user ID, in order to verify a user is an actual user of the product. Hi there! Are you looking to implement a solution like ICANotes?